When Joyce Carol Oates introduced Stephen King to a Princeton audience in 1997, she noted that it’s commonly said that certain people need no introductions. But that, on the contrary, it’s precisely those whom we imagine we know, in broad stereotypical terms, who require introductions. And that, I think, is the case here. 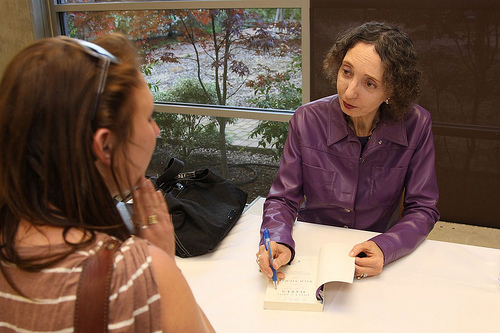 Joyce Carol Oates is prolific: she has published more than 150 books. That is the broad, stereotypical way that many people know her. Every book review of one of her books begins with some variation of that statistic. But here are some different statistics that might put the “150” in a different light. Every year in December the New York Times puts out a list of their notable books of the year. From 1963 to the present, forty of Joyce Carol Oates’s books have been on those lists. Now, the notable books list is not exactly an award, but in the case of Joyce Carol Oates it does seem to be an indicator of the consistently high quality of her work. Also reflecting this are the award anthologies such as the Best American Short Stories or the O Henry Prize Stories series. Twenty-nine of Joyce Carol Oates’s stories have appeared in the O Henry anthologies. That’s more than any writer in the nearly 100 years that the O Henry’s have been around. The next most frequently appearing writers are Alice Adams, John Updike, and William Faulkner. In the Best American Short Stories series, which has also been around for almost a century, Joyce is not the most frequently appearing author. That distinction goes to the great Canadian short story writer Alice Munro with 18 stories. Joyce currently has 17. (Although I’m told that Joyce’s 18th story will appear in the 2011 edition). These are remarkable numbers–plus the fact that her works have also been included in The Best American Essays, The Best American Mystery Stories, The Best American Poetry, The Best American Short Plays, The Year’s Best Fantasy and Horror, and the Pushcart Prize. Now, what do the scholars and critics think about those 150 books? Here’s what four of them have said. Joyce Carol Oates has become one of the elemental forces of American fiction. And yet to the museum keepers of national culture, her skill at resisting critical containment must be unnerving. She picks up and discards generic forms at will. She refuses to restrict herself to one subject, to one stratum of society, one personality type. Indeed, her very productivity stands as a reproach. What’s curious is that Oates writes as if each novel is her first, last and only one, a singular testament to her existence. A future archeologist equipped only with her oeuvre could easily piece together the whole of postwar America. Joyce Carol Oates was perhaps born a hundred years too late; she needs a lustier audience, a race of victorian word-eaters, to be worthy of her astounding productivity … she has, I fear, rather overwhelmed the puny, parsimonious critical establishment of this country. … Single-mindedness and efficiency rather than haste underlie her prolificacy. If the phrase “woman of letters” existed, she would be, foremost in this country, entitled to it. Oates’s achievements are indisputable for anyone who has read her work extensively. Her body of novels, let alone her work in other genres, is among the most wide-ranging in contemporary writing.… she is the nearest America could currently have to a national novelist. It’s as if this prodigious novelist can’t help registering all the voices the culture tries to repress. She hears screams and writes books. I am reminded of Joan of Arc, who heard bells and then immediately had visions. After the rapture of carillons, see Catherine, or Margaret, or Michael … Oates, too, consorts with warrior-angels. 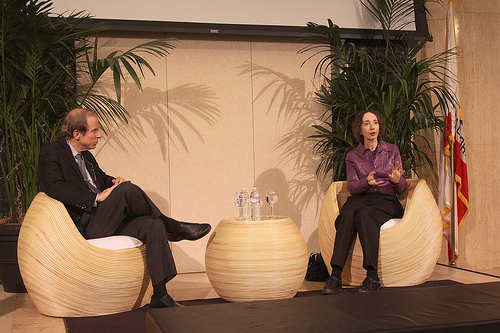 Ladies and gentlemen, please welcome to USF our National Novelist: Joyce Carol Oates.